Print your logo onto these custom printed satin sleeping masks or one of our other innovative beauty items and use them in your next marketing campaign as a unique giveaway item. Satin eye mask in choice of colours (tell us what you need, and we can find you a matching satin colour) with custom logo print. These masks can also be made in silk, at higher cost. 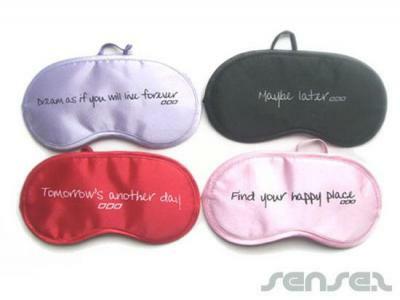 Promotional Satin Sleeping Masks are a fabulous medium to use to promote any Travel or Beauty-related brand. Promotional Satin Sleeping Masks are a premium quality product that will go a mile. These durable promotional products will be a fun addition to any successful marketing campaign, and will leave every customer relaxed and rested. Promotional Satin Sleeping Masks will succesfully enhance brand awareness and brand loyalty as these creative promotional give aways are used time and time again. Other innovative corporate gift ideas that could be suitable to create brand awareness include these cheap promotional Calming Gel Eye Masks, quirky advertising gifts such as these Sleeping Masks or how about using one of our more bespoke custom made products such as these great quality Hotel SPA Slippers? Custom brand these satin sleeping masks or one of our best-selling promotional beauty items with your company logo! Your promotional satin sleeping masks can be silk screen printed in 1 or more colours. Costs shown include a 1 colour logo print on your custom branded satin sleeping masks. We can print more than 1 colour, however it incurs extra costs. We can achieve a perfect PMS colour match for the print. Personalise your satin sleeping masks or custom design beauty items for your marketing campaign. How can these unique promotional satin sleeping masks or our personalised beauty items fit in with your marketing strategy and help you maximise your brand exposure? Our custom made Satin Sleeping Masks can be produced from a minimum quantity of 500 pieces. We can have your logo branded on these corporate Satin Sleeping Masks in 1 Colour Silkscreen Print. A setup fee of AU$180.00 will apply to make the film. The delivery time is 4 - 6 weeks from time of your order.